1 Nautilus wallpaper by Cole & Son in teal ties the color scheme of the window-seat nook to the fireplace surround, as does the border of the roman shade from The Shade Store. 2 Ogden commissioned Colorado-based fiber artist Sarah Huston of Woven to create a wall hanging suspended on a branch scavenged from the foothills of the Rocky Mountains. 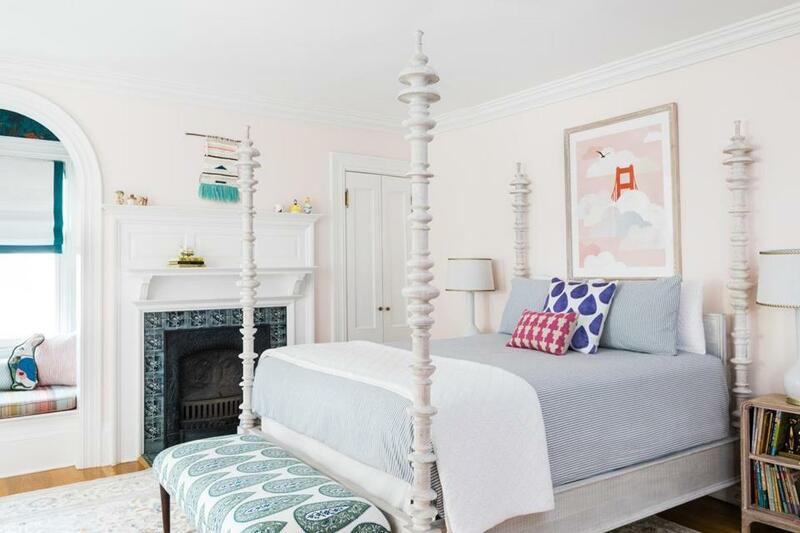 3 To avoid a “Pepto-Bismol situation” but satisfy her daughter’s desire for pink, Ogden painted the walls Benjamin Moore Blanched Coral, which has orange undertones and feels feminine, not childish. 4 The print of Golden Gate Fog by Sue Prue, from Minted, is a reminder of the family’s previous home outside San Francisco. The whitewashed frame echoes the finish of the bed. 5 Kugeler chose the Zoe bed from RH Teen, with turned posts that evoke a spool bed with an 18th-century baroque twist. “With nine-foot ceilings, the room called out for a four-poster,” Ogden says.